2018 Annual Participant Awards & Celebration- ALL WINNERS! 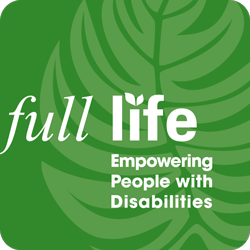 On Saturday, February 10th, Full Life celebrated its eighteenth year of providing robust support services to our Hawai’i Island ‘ohana who have intellectual disabilities! Well attended by participants, family members, support staff, Board of Directors and community supporters, the theme of this year’s event was “The Roaring 20’s”. The Waimea Community Center was transformed into the richness and rave reminiscent of that era; everyone received either a pearl necklace or gold bow tie! An Italian buffet with heart-shaped pasta was served with heart-themed desserts. During the program, participants received certificates of recognition for their outstanding achievements! Pauline Aughe, who served seven years on the Board and chaired the Outreach and Fundraising Committee was honored with this year’s “Mana I Ke Leo” (Power of the Voice) Award! Mar Ortaleza, Employment Services and Outreach Coordinator, a member of the Outreach and Fundraiser Committee, Program Committee, who also took on the Interim Director of Programs position, was also acknowledged for his accomplishments which included being the very first awardee of the Outstanding Advocate of the Year for the East Hawai’i Island Disability Legislative Forum. We were treated to a wonderful preview magic show by Bruce and Jennifer Meyers. Our very own Josie “The Jokester” opened the program with her funny jokes. Fans were given out to everyone, a promotion for our upcoming annual magic show fundraiser, themed “Wonder without Limits” on Saturday, March 10, 2018 7pm-9pm at the historic Hilo Palace Theater! Finally, our Full Life entrepreneurs had their own room where they successfully sold their art and crafts. A fabulous photo booth was a the backdrop to this year’s fun event! We extend a big mahalo nui loa to the many people who made this event a success! Enjoy the pictures taken by Louie “Greece Lighting” Perry, III on our facebook page! Annual Participant Awards & Celebration- WINNERS! On January 14th, Full Life celebrated its seventeenth year of providing service to our Big Island community members in East and West Hawaii. Well attended by participants, family members, and support staff and community members, the theme of this year’s event was the Oscars. Participants received certificates of recognition for their outstanding achievements and, in addition, each participant received an Oscars award! We extend a big mahalo nui loa to the many people who made this event a success. Annual Awards Celebration: RSVP January 11, 2017 – Lights! Camera! PARTY! Aloha Full Life Participants, Direct Support Professionals, and circle of Supports! * East Hawai’i can RSVP with Emily at (808) 935-7699 or Emily@fulllifehawaii.org. * West Hawai’i can RSVP with Barbara at (808) 933-3222 or Barbara@fulllifehawaii.org. We look forward to congratulating our participants on their awards, and celebrating our superstar professional and circle of supports – Hollywood style! Have a cheerful and fantastic new year! Annual Participant Awards & Supports Celebration: Lights! Camera! PARTY! Aloha Full Life Participants, Direct Support Professionals, Community and circle of Supports! Join us for our annual Awards Celebration party, themed “Hollywood Oscar Party”! There will be Participant awards for individual accomplishments, giveaways, food and other festivities! We look forward to congratulating our participants on their awards, and celebrating our superstar professional, community and circle of supports – Hollywood style! We are sorry to inform you that the Full Life second annual “Chill Before you First Fri” arts and crafts fair THIS FRIDAY at our Hilo office has been CANCELLED. For more information, contact Emily Twidwell at (808) 935-7699 or Emily@fulllifehawaii.org . Buying on Amazon? Give twice – FREE – when making your online purchase, please click on this link: AMAZON SMILES. .05% of your purchase will be donated to Full Life! 2016 FINAL EVENT: “Chill Before you First Friday” Arts & Crafts- POSTPONED! Join us for our final event in 2016! 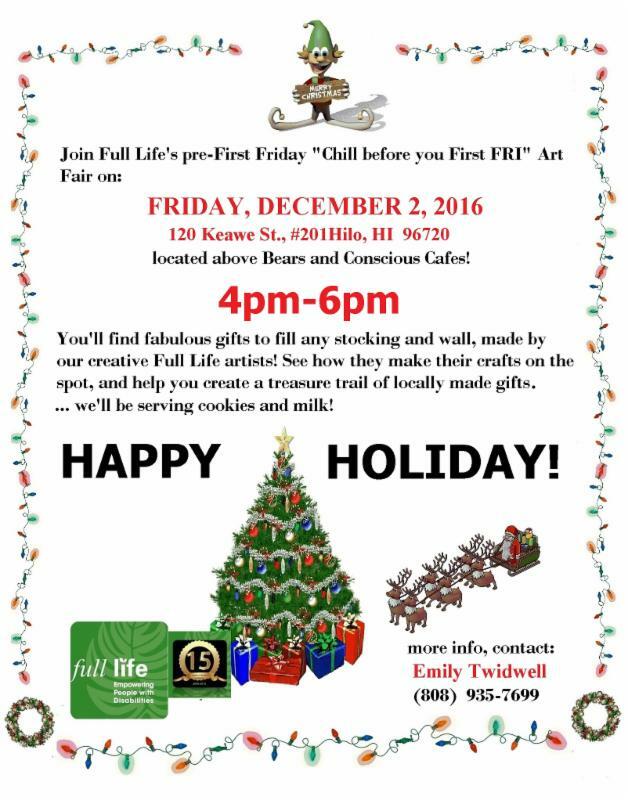 Full Life second annual “Chill Before you First Fri” arts and crafts fair has a variety of unique gifts for your giving, FRIDAY December 9th at our Hilo office 4pm-6pm. Join us for our final event in 2016! Full Life second annual “Chill Before you First Fri” arts and crafts fair has a variety of unique gifts for your giving, THIS FRIDAY at our Hilo office 4pm-6pm.